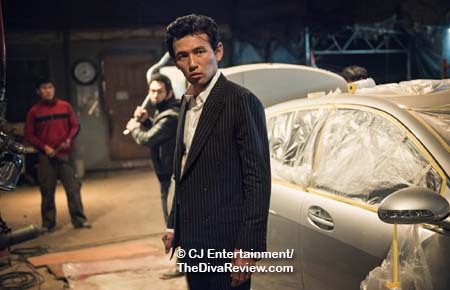 From its very first seconds, when a rich, trashy couple sashays through a luxury car dealership to the pounding beat of Blondie’s disco thumper, Heart of Glass, as salesmen fall over themselves to faun and flatter, one gets the sense that Veteran is going to be a departure from director Ryoo Seung-wan’s previous blockbuster smash, the dark, violent spy thriller, The Berlin File. 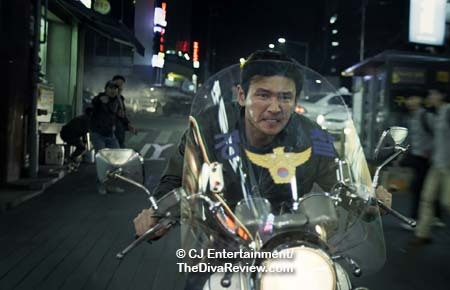 The proceeding car chase, harrowing not as much because of its presumptive high-speed danger, as for the misfits with badges behind the wheel, lets us know that old Ryoo habits die hard. 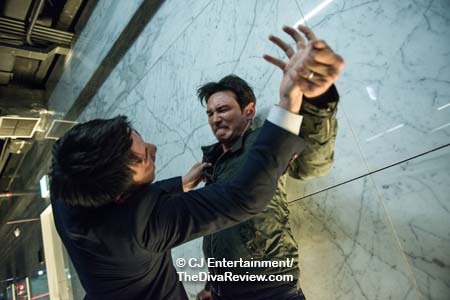 Detective Do-cheol gets no respect. His wife harangues him for not holding up his end of the household duties and his supervising officers simply pile on the complaints about his hands-on approach to policing. Sometimes it can’t be helped that a little leading might be needed to bring a perp in for questioning. Surely, the criminal was thinking about punching Do-cheol in the face, wasn’t he? So what if the cop made his wish come true? Of course the resulting self-inflicted cuts and bruises are enough to get the crook arrested. 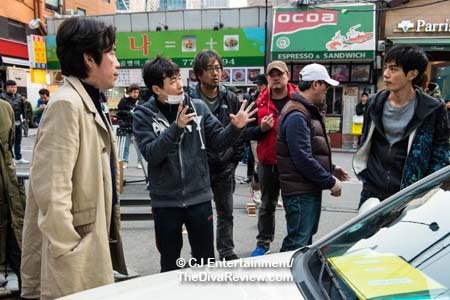 So goes the cowboy style of policing practiced not only by Detective Do-cheol, but by the rest of the motley crew that is his team. A mix of jaded veterans (hence the title) and enthusiastic rookies; other squads give a wide berth to the squad and their reputation follows them like a dark cloud despite their successes. 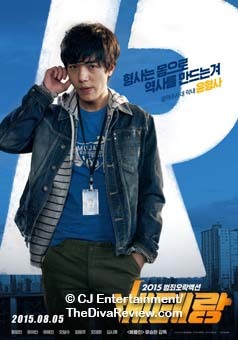 Still, amongst his teammates and the regular folks he depends on to help his operations, Do-cheol’s a pretty good guy. It’s his friendship with one of those civilians that kicks off our story. A truck driver named Bae assists the team in a big operation and Do-cheol offers the proud, hard-working man his card in gratitude after successfully wrapping up the bust. Bae will be using that card sooner than he thinks as he and his fellow truckers are cheated of their earnings and booted from their jobs for unfair grounds. Attempting to speak with the owner of the trucking company, Bae is invited into the office of Tae-oh, the cool, sleek young son of the firm’s owner. 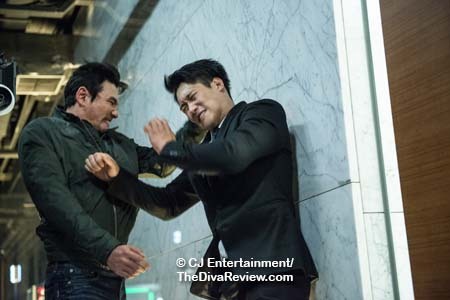 What starts off as a simple business negotiation becomes a nightmarish mockery of the trucker’s honourable intentions that finds Bae physically battling for his life and dignity in front of his grade-school son, all at the insane whim of the depraved executive. 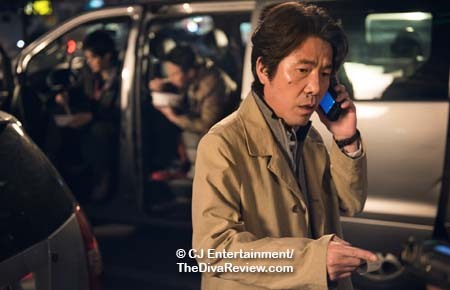 Unable to answer his phone when Bae called for his assistance, Do-cheol is shocked to ring back to discover Bae hovering between life and death in an emergency room, wrapped in bandages from head to toe after what the cop is told was a suicide attempt. 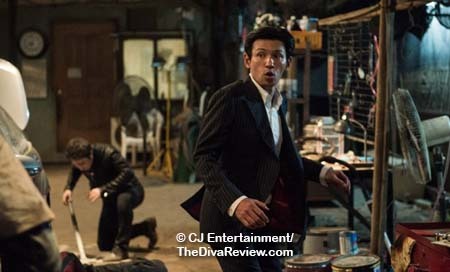 The nonsensical claim springs Do-cheol into action, triggering an investigation that quickly leads him right to Tae-oh’s door. Of course, being a VIP has its privileges, in Tae-oh’s case that includes having someone on permanent call to shield him from the harshities of life. 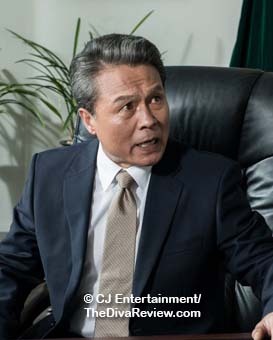 Tae-oh’s right-hand man, his cousin, the Vice President Choi, runs interference for him and official complaints about the police nosing around come pouring into Do-cheol’s stationhouse, which have the effect of cowing the higher-ups and quashing the investigation … theoretically. 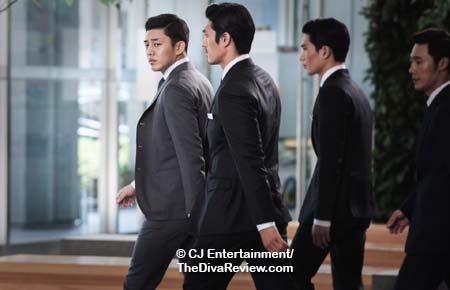 Unfortunately for Tae-oh, he is unaware of two important facts: First is that Do-cheol is apparently part tick and refuses to unstick himself from the dissipated chaebol’s side, no matter how he’s threatened. Second is how Do-cheol’s police team supports their guy, even in the face of extreme consequence and backing him unconditionally no matter how crazy the strategy. Really, Tae-oh should’ve just given Bae his money and called it good. Rollicking. That’s the first word I think of when I consider this film. It starts on all four cylinders and doesn’t really let up. 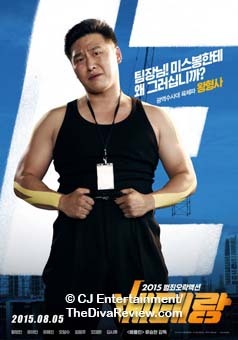 Writer/director Ryoo Seung-wan lets the comedy fly in a way he hasn’t since 2008's Dachimawa Lee. 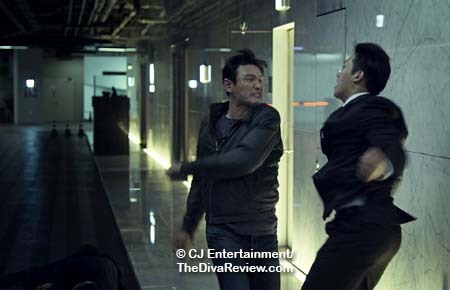 Of course, as it’s a Ryoo Seung-wan picture, there will be action, and it’s pretty great. 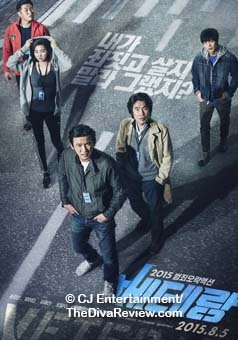 With high-octane car races through the streets of Seoul (totally without CGI, Ryoo told me) and a hilarious foot chase between the cops and some Russian thugs on the docks of Busan, the action doesn’t have the life or death intensity of The Berlin File, but is still hugely enjoyable, which was kind of the point. 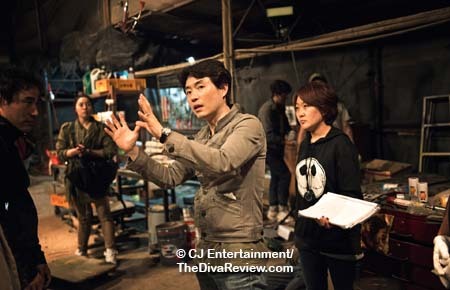 The amazing cast, headed by Hwang Jung-min as Do-cheol, seems more like they’re at summer camp than working hard on a film. 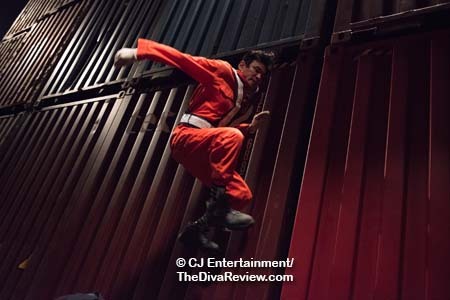 That’s the comfort level that permeates the celluloid. Regardless of their easiness on screen together, there’s not a false step or sloppy note anywhere. 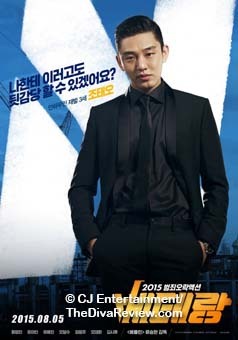 Yoo Ah-in plays the debauched young chaebol, Tae-oh, with alternating baby-faced charm and demonic corruption. When Tae-oh has one of his cold-blooded, sadistic fits, or renders twisted punishments even unto his own people - often for no reason other than he can - the audience holds its breath until the deed is done. It’s a very different role for the homey, sweet-faced, Yoo, who’s more known for playing downcast, bullied kids, or faithful, good-hearted sons, and he runs with it, chewing up just enough of the scenery without being campy (and there are some OTT moments of rich-boy-gone-amok ugliness) and holds his own admirably opposite the veteran stars. 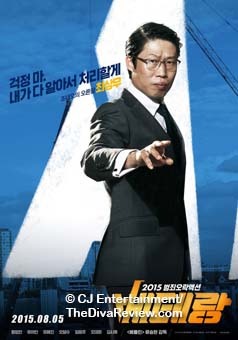 Yoo Hae-jin as the long-suffering VP of the company has no choice but to continuously clean up his superior’s messes with little to no regard of the fact that they are cousins. If anything, that blood relation is used against him as he is little more than a literal whipping boy for golden child, Tae-oh, even to the point of being persuaded to do years of jail time in his place. In a way-too-small role as Do-cheol’s beleaguered wife, Jin Kyung crackles with affronted pride and sass as an attempt by Choi to bribe the lady into dissuading her man away from Tae-oh’s trail takes a very unexpected turn. 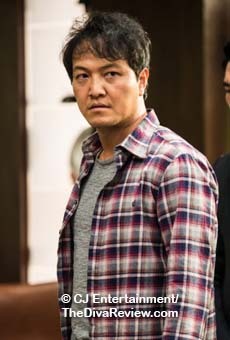 Hwang reunites with his BFF from Ode to My Father, the excellent Oh Dal-su, who plays Do-cheol’s chief, together with Cheon Ho-jin, as their put-upon superintendent. The scene where the men compare bodily wounds as a way of determining who’s sacrificed most to the police force is a hoot. Quien es mas macho? Of course, no discussion of Veteran would be complete without some mention of that breakout character known as Miss Bong. 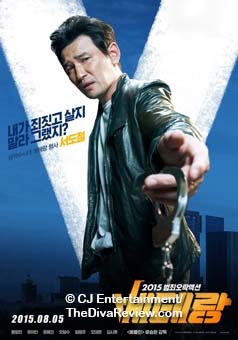 During my interview with Ryoo Seung-wan, he spoke of wanting to turn Veteran into a series like the Lethal Weapon films (which he said this movie is inspired by), I demanded he set an entire chapter around the sole female in Do-cheol’s team. 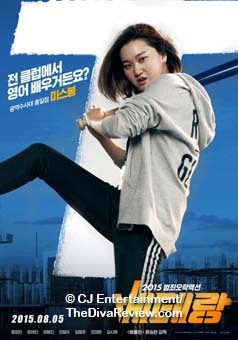 Whether it’s by way of her feisty charms (watch her mesmerise the rookie), or her powerful kicks, this one-lady hurricane of justice blows through the movie and leaves a trail of stunned menfolk in her wake. 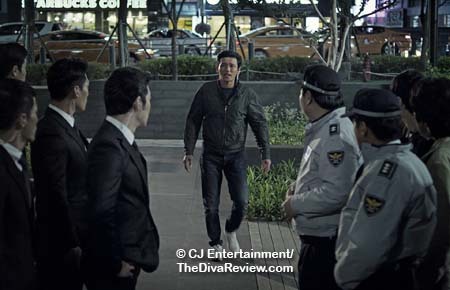 Jang Yoon-ju’s charisma as the mighty but feminine officer is one the film’s many highlights. 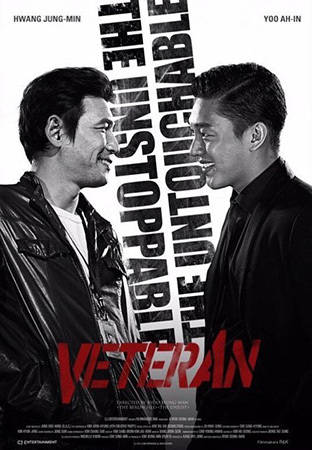 While Director Ryoo told me he had no intention of putting social messages into his films; it’s pretty obvious that Veteran is a morality play of the poor-but-honest working class against the dissipation and arrogance of the “untouchable” rich. The degeneracies are drawn in pretty broad strokes, but sometimes one just wants an uncomplicated hero to cheer for, and an easily understood, moustache-twirling villain to hiss at. 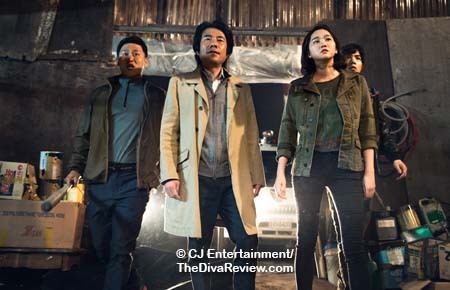 That, along with Veteran’s exceptional cast, a tight, sharp script with perfect rhythm, rip-roaring comedy, and of course, the exciting action we’ve come to expect from director Ryoo Seung-wan, makes Veteran an excellent time at the movies. 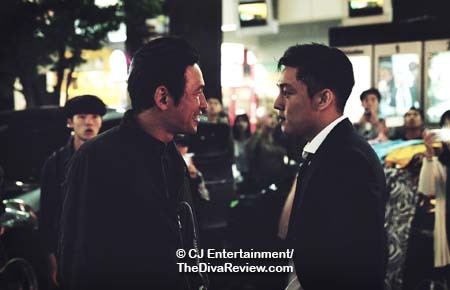 Click here for our interview with Veteran director Ryoo Seung-wan from September 2015. 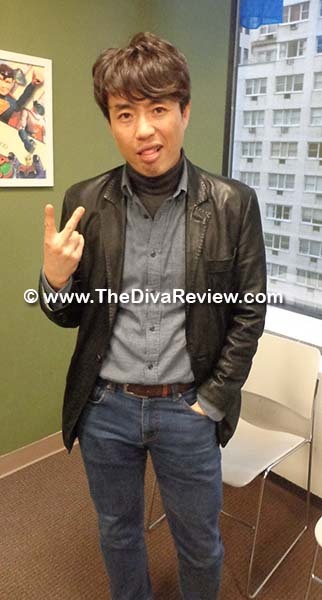 Click here for more Veteran interview goodness with Director Ryoo from the New York Korean Film Festival in November, 2015.